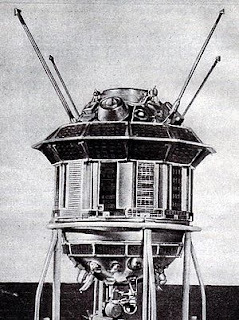 On October 7, 1959, the Soviets sent an "automatic interplanetary station" to the moon. This, in itself, was an amazing achievement. Even more amazing is how they managed -- using 1950s technology -- to photograph the far side of the moon and get the images back to the earth. 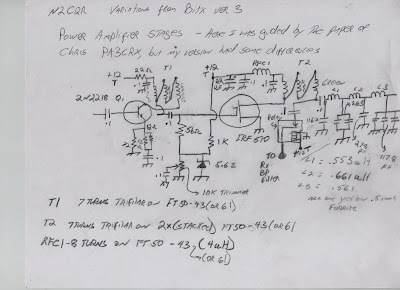 The Soviet document on the Harvard site (below) says that the transmitter put out "a few watts" and used semiconductors. There appears, however, to have been at least one vacuum tube aboard (the cathode ray tube used to scan the chemically developed photo negatives). 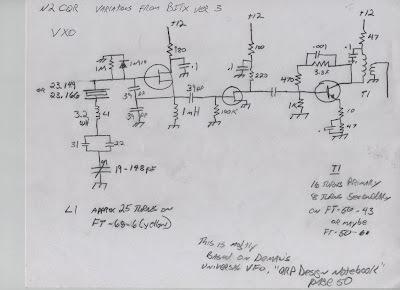 Frequency modulated analog video similar to FAX) was used to send the data. Luna-3 was the first successful three-axis stabilized spacecraft. During most of the mission, the spacecraft was spin stabilized, but for photography of the Moon, the spacecraft oriented one axis toward the Sun and then a photocell was used to detect the Moon and orient the cameras towards it. Detection of the Moon signaled the camera cover to open and the photography sequence to start automatically. The images alternated between both cameras during the sequence. After photography was complete, the film was moved to an on-board processor where it was developed, fixed, and dried. Commands from the Earth were then given to move the film into a scanner where a spot produced by a cathode ray tube was projected through the film onto a photoelectric multiplier. The spot was scanned across the film and the photomultiplier converted the intensity of the light passing through the film into an electric signal which was transmitted to the Earth (via frequency-modulated analog video, similar to a facsimile). A frame could be scanned with a resolution of 1000 (horizontal) lines and the transmission could be done at a slow-scan television rate at large distances from the Earth and a faster rate at closer ranges. 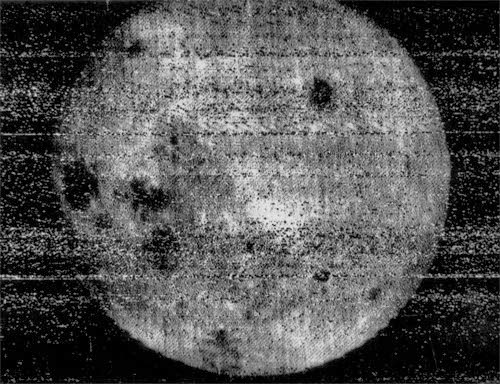 The camera took 29 pictures over 40 minutes on 7 October 1959, from 03:30 UT to 04:10 UT at distances ranging from 63,500 km to 66,700 km above the surface, covering 70% of the lunar far side. Seventeen (some say twelve) of these frames were successfully transmitted back to the Earth, and six were published (frames numbered 26, 28, 29, 31, 32, and 35). They were mankind's first views of the far hemisphere of the Moon. I got tired of popping the hood and manually changing my VXO crystals. First I tried to switch the rocks using a rotary switch on the front panel, but I think the leads were too long and the output was kind of squirrely. So I dug around in the junk box and found a 12 volt double pole double throw relay. I put the crystal sockets across the two poles and ran leads from the armature terminals to the crystal terminals. I use the rotary switch to activate the relay. 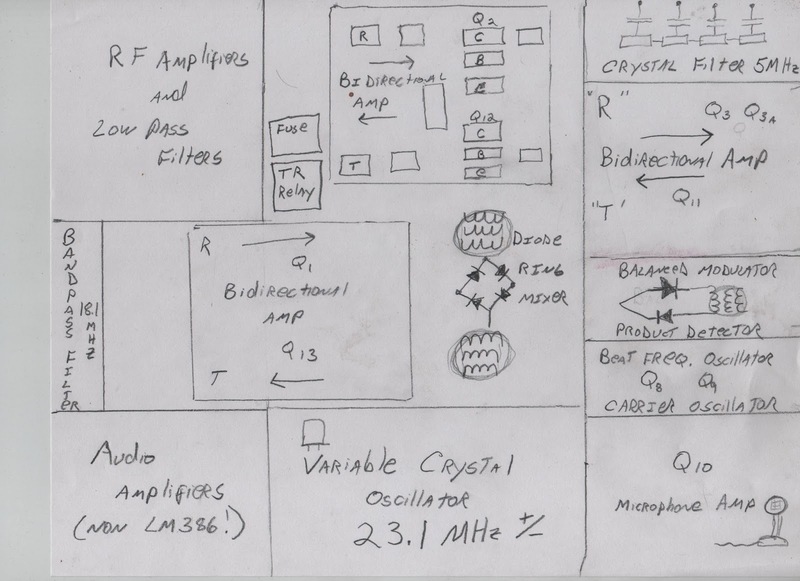 I cover about 41 kHz of the 17 meter band with the two crystals. 17 meters has been in great shape. On November 16 I had a very nice contact with Syd, ZS1TMJ in Glenwilliam, South Africa. That's about 8000 miles on 5 watts SSB. Hack-A-Day ran a story on EME pioneer Zoltan Bay. In the comments section someone posted this memorable video about a moonbounce station in Central Kansas. Wow. Putting using naval gun as an AZ-EL rotor for the dish is really thinking outside the box. Then deciding to put the whole thing atop another tower... Great stuff. Here is another moonbounce video. VE2ZAZ was using a smaller antenna (!) and JT65. FB. 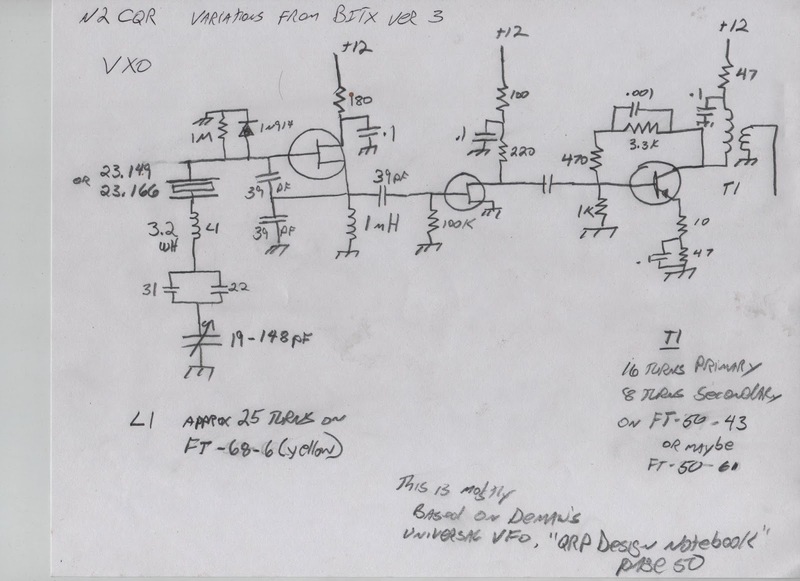 Pete Juliano, N6QW, is an electronic genius. The ideas in his SPRAT article will be of great use to all those who share in Doug DeMaw's devotion to VXOs and reluctance to spend money. 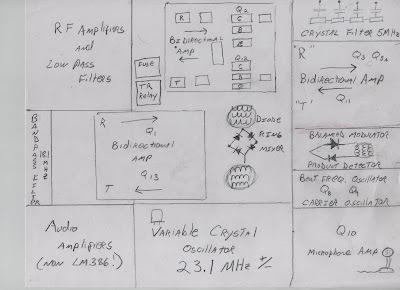 I'm really tempted to go back and re-do my BITX using Pete's 11.52 MHz computer crystal super-VXO and 4.9152 IF (I could then take my expensive 23.1 MHz crystals and put them back in my Doug DeMaw Barebones Superhet). 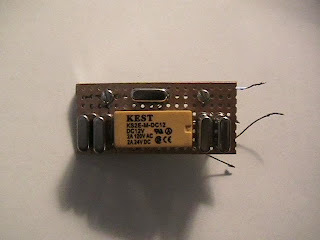 I also like Pete's DPDT reed relay crystal switcher too. 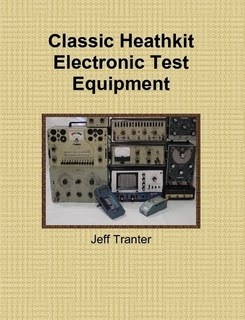 Three cheers for Pete Juliano, Doug DeMaw, and SPRAT! And thanks to WB9FLW for reminding us of Pete's articles. Your BITX17 really has me fired up! I came across an interested Super VXO by Pete N6QW for use on 17 Meters. This gets you on 18.120 to 18.150 using these two standard xtals. Thanks for all your efforts they are much appreciated!! We've put cameras in kites and rockets, but I think this is much cooler. The files of the BITX20 Yahoo group were very useful to me during my BITX build. So I have decided to make a contribution myself. I uploaded a few drawings today. 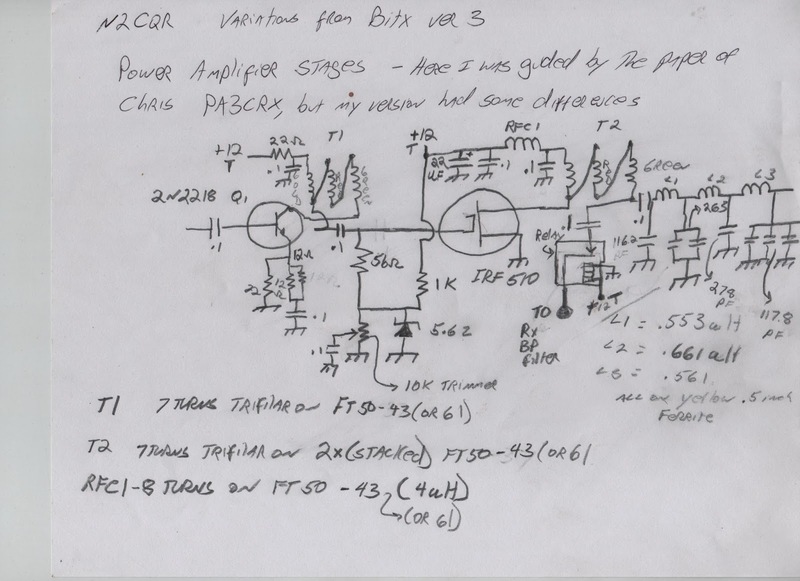 Here is how I laid out the circuitry on my 8 inch by 11 inch copper clad board. I included the isolation (Manhattan) pads for one of the bidirectional amps. 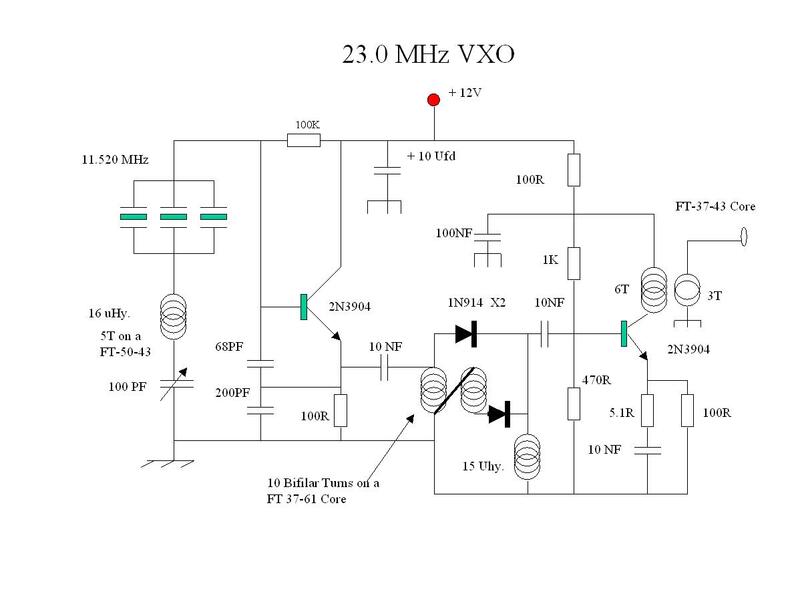 Here is the VXO. I built is on a separate board, but I could have put it on the main board. 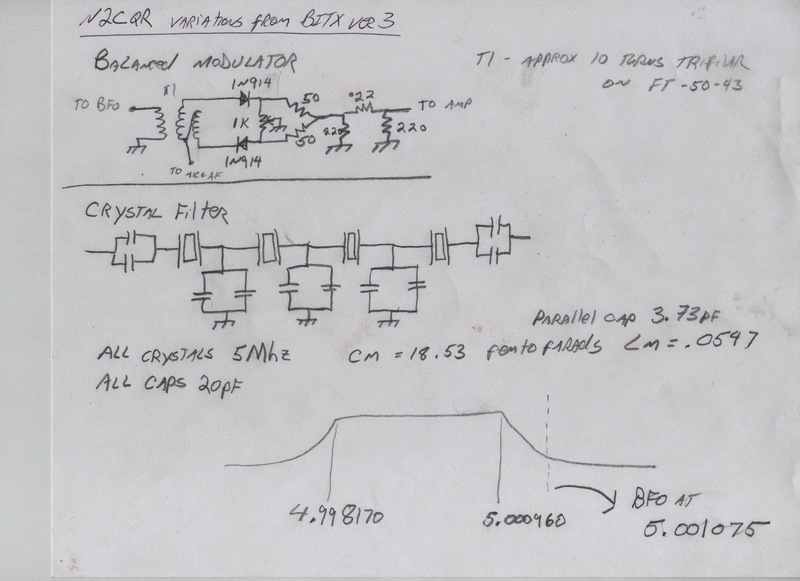 Here is the balanced modulator and crystal filter. Here is the power amplifier circuitry. Amazingly easy to stabilize. In this video, YC0AFF in Indonesia seems to be having as much fun with his new BITX as I've been having with mine. I think there is something special about those early contacts, when the newly finished (or not quite finished!) rig is still on the workbench. 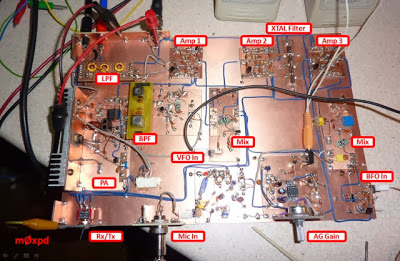 Designed in India and built by radio amateurs all around the world, the BITX has become a global ham radio phenomenon, reminding us that we form an International Brotherhood of Electronic Wizards. 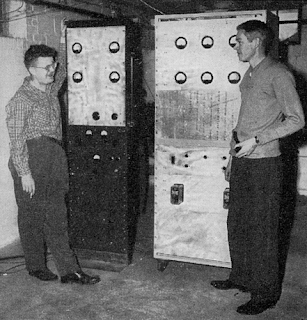 The link below will take you to an amazing collection of QST articles describing the early days of EME or "moonbounce." Very interesting. I was really blown away when I found out that Ross Bateman, W4AO, (pictured above, on the left) did the very first amateur moonbounce work from the small suburban Washington town that I live in now -- Falls Church, Virginia! I am trying to find OM Ross's old address or more info about him. 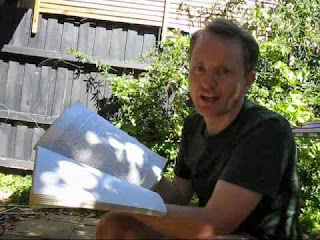 If anyone has an old callbook, could you please look up Ross Bateman, W4AO, aka W4XNB? He worked at the National Bureau of Standards. The moonbounce story is filled with interesting technology and characters and clubs. Sam Harris and his Rhododendron Swamp VHF Society sounds like our kind of group! Scroll through the OK2KKW web site and you will come across our esteemed Doug DeMaw and Bill Orr. In March 1944, Bay recommended using the radar for scientific experimentation, including the detection of radar waves bounced off the Moon. The scientific interest in the experiment arose from the opportunity to test the theoretical notion that short wavelength radio waves could pass through the ionosphere without considerable absorption or reflection. Bay's calculations, however, showed that the equipment would be incapable of detecting the signals, since they would be significantly below the receiver's noise level. The critical difference between the American and Hungarian apparatus was frequency stability, which DeWitt achieved through crystal control in both the transmitter and receiver. 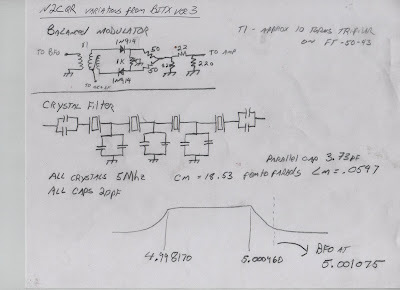 Without frequency stability, Bay had to find a means of accommodating the frequency drifts of the transmitter and receiver and the resulting inferior signal-to-noise ratio. He chose to boost the signal-to-noise ratio. His solution was both ingenious and far-reaching in its impact. 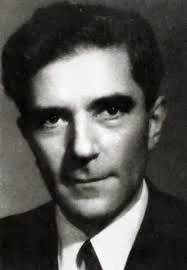 During the war, Zoltán Bay protected Jewish colleagues from Nazi persecution. In 1998, the State of Israel honored him as Righteous Among the Nations for his actions and listed his name at Yad Vashem. BITX Build Update #18 -- BITX in a Box? I've really been enjoying using my BITX17 without an enclosure. Having all the electronics exposed on the workbench really accentuated the homebrew nature of this rig. But obviously it was time to box this thing up. At a local craft store, I found a wooden box that is exactly the right size for my BITX copper clad board. I put the BITX in the box yesterday. I kind of miss the exposed electronics. The far left control is AF gain. The need for a few inches of wire to the pot has introduced a bit of AC hum. I'll try to knock this down with better shielding on the lead to the pot. But this gets brings us too a bigger question: the need for a cabinet that shields. Obviously the wood shields it only from dust. I know there are some benefits to putting this thing in a proper metal box. The AC hum would be less of a problem. Also -- listen to this -- in the morning, before 17 opens, I can hear -- faintly -- the WWV transmission on 5 MHz (recall that the IF in this rig is 5 MHz). And if I ever build an external linear amp for this rig (I might), I guess a proper metal box would help prevent the kind of oscillation that often drives me crazy on these kinds of projects. So, what do you guys think? Stick with the wood, or put it in a metal box? Any thoughts on putting metal shielding material around the inside of the box (thick aluminum of tin foil)? 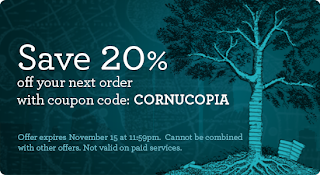 And on all Lulu books. 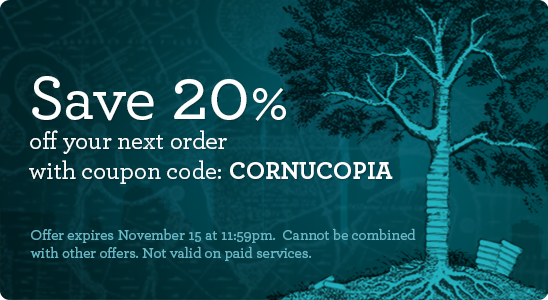 Just use the coupon code FALLSALE40 at checkout. The Arecibo Observatory opened on this date in 1963. At a diameter of a thousand feet, it's the largest single-aperture telescope ever built. It's also got the largest focusing dish in the world, which gathers electromagnetic waves from space. Located near the city of Arecibo in Puerto Rico, it's close to the equator, which enables it to "see" (via radio waves) all the planets in the solar system; within six months of its opening, it enabled scientists to study the rotation rate of Mercury and determine that it rotated every 59 days, rather than 88 as was previously thought. It's also been used for military purposes like locating Soviet radar installations by tracking their signals as they were reflected off the moon. It's provided the first full imaging of an asteroid and also led to the first discovery of planets outside our solar system. In 1999, it began collecting data for the SETI Institute; SETI stands for "search for extraterrestrial intelligence," and the organization looks for deliberate radio or optical signals from other planets. 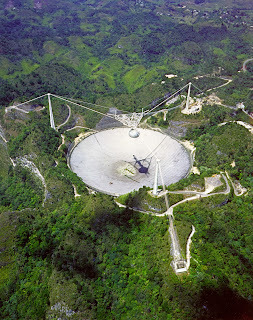 The Arecibo Observatory also sends data over broadband to the home and office computers of 250,000 volunteers, who, through the Einstein@Home program, donate their computers to be used for data analysis during periods when they would otherwise be idle. A year ago, three such volunteers in Iowa and Germany discovered a previously unknown pulsar, 17,000 light years from Earth.